This site uses the latest Flash Player. Upgrade your Flash player for free at Adobe. a free monthly eNewsletter delivered directly into your Inbox. Founded in 1995, the International Coach Federation (ICF) is the leading global organization dedicated to advancing the coaching profession by setting high standards, providing independent certification, and building a worldwide network of credentialed coaches. 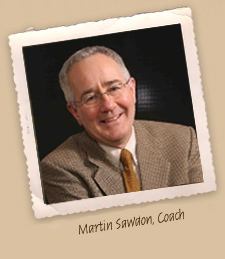 Martin's Professional Coach Certification attests that he has successfully completed an ICF-approved training program, has logged at least 750hrs of coaching, that his coaching has been audited by two-other Professional Certified Coaches and that his application has been supported by two other PCCs who have vouched for his compliance with the ICF Code of Ethics. Martin is one of two PCCs currently practising in Edmonton, Alberta. My purpose in life is to be a great husband and father while helping emerging leaders become the people they need to be to create Sustainable Workplaces™. I do this through my coaching, dialogue circles, seminars and workshops. Welcome to my website: please join me to embark on your own heroic quest! What if your organisation made an outstanding profit, year after year after year, your clients raved about your service and innovation and your people bragged about the success of your organisation and what a great place it was to work? I am inspired by mountains and sustainability. My favourite mountain range is called Sustainability, my favourite peak, The Sustainable Workplace™. It's the summit of extraordinary profitability achieved through growing its most valuable resource-people-rather than consuming it like a fossil fuel. So put on those walking boots, grab your backpack, your map and compass, your nutritious food, your sketch book, your birding guide and your binoculars and join me in inside! #3. It's important to learn how to better prepare my staff, customers or colleagues for change. 101 Things © 1997 by Coach University. All rights reserved. Coaching Works offers Executive Coaching including Alberta Executive Coaching, Alberta Leadership Executive Coaching, and Alberta Executive Business Coaching. They offer programs that are designed to help with achieving a sustainable workplace using Executive Coaching, Leadership Executive Coaching, and Executive Business Coaching.